As energy bills hit the doormat after our recent harsh winter, most people will be worried about the high cost of having kept the heating on. Log has high levels of natural insulation helping to keep energy costs low throughout the year, so cosily warm in the winter but also pleasantly cool in the summer. Speak to our customers and it’s one of the first things they will mention! Take John and Lizzie Hopthrow from near Canterbury. They’ve recently moved into a two-bedroom log cabin annex and were so impressed with the performance of the building over the winter, they took this photograph above to show how well insulated it is. Note the amount of snow on the cabin’s roof compared to the less efficient brick house next door which is leaking heat. 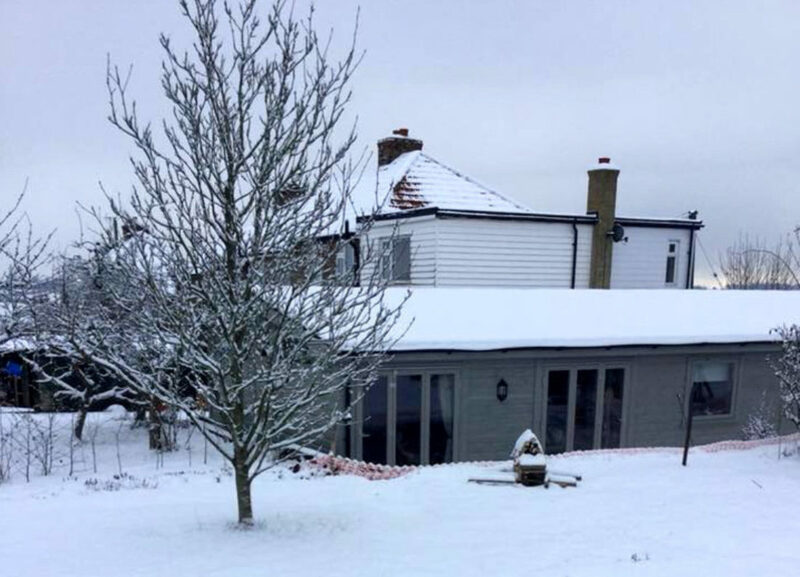 Customers Rosemary and John Young have found they only need their log burner to heat their cabin during the winter. “It’s so cosy and warm,” said Rosemary. Ian and Mary Fisher say the same. They fitted electric heaters but have found the only heat source they need to use their large two-bedroom cabin is their log burner. So, if you’re thinking about an annex, home office, garden room or similar, and worrying about running costs, why not take the heat out of the decision and choose a solid log building.